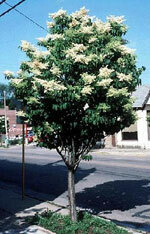 Property owners must obtain a permit to plant trees or other flora in the right-of-way. There is no fee associated with this required permit. The purpose of the permit process is to ensure that new street tree plantings are appropriate for the size of the planting strip available, will not cause damage to sidewalks and curbs or excessive litter, and will be a good addition to the city's urban forest. The commission recommends that anyone considering a street tree planting first review the Permit Checklist. This will assist in determining what size tree may be planted. No new trees are allowed in a planting strip of less that four feet. Completed Permit Applications should be submitted to City Hall for review and approval by the Greenscape Commission. This permit is required only for street tree plantings. For questions regarding Street Tree Planting Permits, or for help with choosing a tree for planting, the Greenscape Commission is available to assist you.